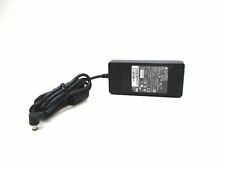 NEW Quality Power Supply AC Wall Adapter for Magic Jack Universal. USA Seller. Does Not Include AC Adapters. There is no rental. I will assist with help for the setup if needed. VigorTalk device. Obihai OBI200 VoIP Phone Adapter Google Voice. Condition is Used. Shipped with USPS Excellent condition and never failed, moved away from Google Voice and to another VoIP provider and don’t need it. CAT5 and power cable included, shipping in an OBIHAI brown box from an older OBI100 unit, just so there’s no confusion this is indeed an OBI200 as indicated on the back of the unit. OBIHAI ObiLine USB Line Adapter - FXO to USB NEW . Supports 2 SIP profiles through 1 FXS port and 1FXO port. UK Power Adapter. Supports T.38 Fax for creating Fax-over-IP. Key Highlights. Ethernet Cable. If it's not in the pictures, it's probably not included. Whether it's a laptop, desktop, LCD, printer or one of our other amazing deals, each piece is coming to you off-lease. As such, while the physical condition of the machine may feature small scratches or blemishes, each piece is in good working condition, ready to provide you the best experience possible. 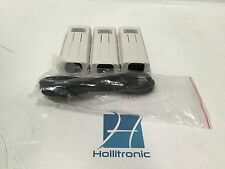 HT502 Grandstream 2 Port Analog Adapter. SPA122 ATA Adapter. I connected the adapter with my ring-central account and its working. Original Box. Works with Up to Four (4) VoIP Services Across One (1) Phone Port. Use Google Voice with the OBi and enjoy free calls inside the USA and Canada. Works with Google Voice. Also Supports T.38 Fax and SIP Bring Your Own Device Services like Anveo, Callcentric, Voip.ms, etc. Allow you to keep very minimal credit in sims. Automated USSD. FXO Gateway TA1610. TA1610 is a stand-alone FXO VoIP gateway with carrier-grade features and reliability. TA1610 supports PnP or DHCP provisioning by MyPBX and standard open protocol TR-069 and SNMP. This is Ericsson Bs201 DECT Base Station KRCNB 201 03/1 R3A and was used but is in Good Working Order. 8 Port Voip Gateway Supports 2 SIP profiles and 8 FXS ports. Supports 2 SIP profiles and 8 FXS ports. Number FXS Ports 8. Supports dual Gigabit network ports. 3-way voice conferencing per port. Color Black. Built for users looking for a strong analog-to-VoIP converter, it features Grandstream’s market-leading SIP ATA/gateway technology with millions of units successfully deployed worldwide. Supports 2 SIP profiles and 8 FXS ports. AVAYA SPPOE-1A, 700500725 IP Phone Signal Port Power PoE Injector with AC cord. Condition is Used. Shipped with USPS First Class Package. This unit is new and still in its original box. Pictures are of the actual unit and its accessories and only they are included in the sale. No software/driver discs, cables, mounting hardware, etc. are included unless pictured and/or described. FXO Gateway TA410. TA410 is a stand-alone FXO VoIP gateway with carrier-grade features and reliability. Featuring book-like design, TA410 is elegant in appearance and flexible in installation. It is a desktop device and also wall mountable. The Cisco ATA 190 Number of FXS (RJ-11) Ports: 2. Each port supports either voice calls or fax sessions, and both ports can be used simultaneously. Product Model: ATA 190. Manufacturer: Cisco Systems, Inc. MANUFACTURER: Cisco Systems. We tested the unit by power-on test and ensured that knobs and buttons are in working order. Review pictures for more details. INCLUDED: Unit only. PART NUMBER: ATA188-I1-A. 10 x SPA2102 Phone Adapter. Linksys ATA Administrator Guide. VoIP Protocols SIP v2. 10 x 5V Power Adapter. Features DMZ port, DHCP support, NAT support, Syslog support. Data Link Protocol Ethernet, Fast Ethernet. (You might receive the item in original Linksys or white unlabeled box. ). INCLUDES: 1x Unit with 3rd-party AC adapter. If it's not in the pictures, it's probably not included. Whether it's a laptop, desktop, LCD, printer or one of our other amazing deals, each piece is coming to you off-lease. FIND A LOWER PRICE?. We usually beat our competition! Hawaii, and Alaska. *New* Cisco SPA112 2 Port Phone Adapter ! !+50 AVAILABLE!! 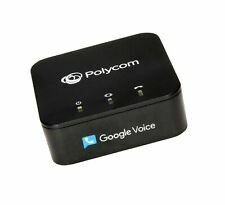 Now you can use your phone over the Internet, without compromising on voice quality or phone and fax features. Easy to install and use, the SPA112 works over an IP network to connect analog phones and fax machines to a VoIP service provider. Ooma Telo Air Home Phone Service with Bluetooth Adapter NEW Refurb! Includes: Ooma Device, bluetooth usb adapter, power cord, ethernet cable, manuals. I bought it as a manufacturer refurb bundle from newegg a couple months back. Der Adapter ermöglicht zwei Gespräche gleichzeitig. Anrufen und angerufen werden wird einfach. Der DVG-5121SP sorgt mit Prioritätswarteschlangen (Priority Queues) dafür, dass Videos oder Computer-Spiele bevorzugt übertragen werden. Up for sale used working Lot of 9 PowerDsine PoE Power Injector PD-3501G/AC Gigabit / includes power cords. it has scratches . UK Power Adapter. Supports T.38 Fax for creating Fax-over-IP. HT 812 Key Highlights. Ethernet Cable. BRAND NEW IN BOX VONAGE - HT802 GRANDSTREAM TELEPHONE ROUTER ADAPTER. GREAT BUY !!! Thank you for your bidding !!! Any question please feel free to contact us. 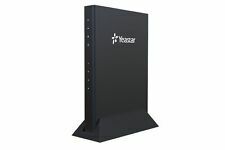 Yeastar TA400 supports 4 FXS ports to connect analog phones to IP-based data networks. It is compliant with SIP industry standard and compatible with various PBX, IP-PBX, softswitches, and phones. FXS Gateway TA400. Model ETM-1024-HYB-CR. Includes 2 25-pair cables, power cord, punchdown block with standoff bracket, and one Ethernet patch cable. Product Model #: HT818. Built for users looking for a strong analog-to-VoIP converter, it features Grandstream's market-leading SIP ATA/gateway technology with millions of units successfully deployed worldwide. Shoretel PowerDsine 3001-GC PoE Power Injector PD-3001GC/AC Lot 2x. Condition is Used. From a working church environment.